Any kid in 5th grade geography class is going to have a big problem calling these plots of land "islands" - after all, they're connected to the "mainland" by land, making them actually peninsulas. Close enough for marketing, I guess, and perfect if you want a bay view resort that's close, very close, to the airport and attractions. Closest to the airport is Harbor Island with a marina on one side and incredible bay views on the other. 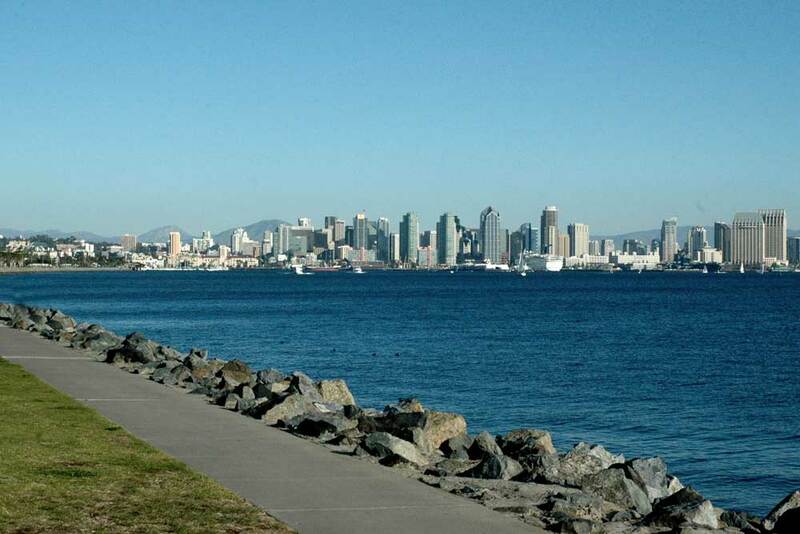 Don't let the airport location scare you, this is prime time San Diego with plenty of hotel and restaurant options. Down the road a bit is Shelter Island, home to our once thriving tuna fishing industry but now know more for its marina and summer concerts. If you're looking for a tropical hotel with water views - often for a surprisingly good rate - then head over to Shelter Island. It feels a bit like The Brady Bunch Goes to Hawaii! With the Tiki torches, splashing waterfalls and squawking macaws, you'll feel like you've been transported back in time to an old school Hawaiian hotel. All the things that make a great vacation hotel are here, from the sailboat views to the lush tropical grounds to the excellent location close to the attractions. There are regular rooms and suites, some have kitchens and views vary from garden to marina to bay. The rooms are 3 star nice, newly updated with modern tropical decor. Great pool and resort setting. There's also an excellent onsite restaurant worthy of visiting even if you're not staying here as well as the lively Backstage Live, a great place to hangout to listen or dance to live music. 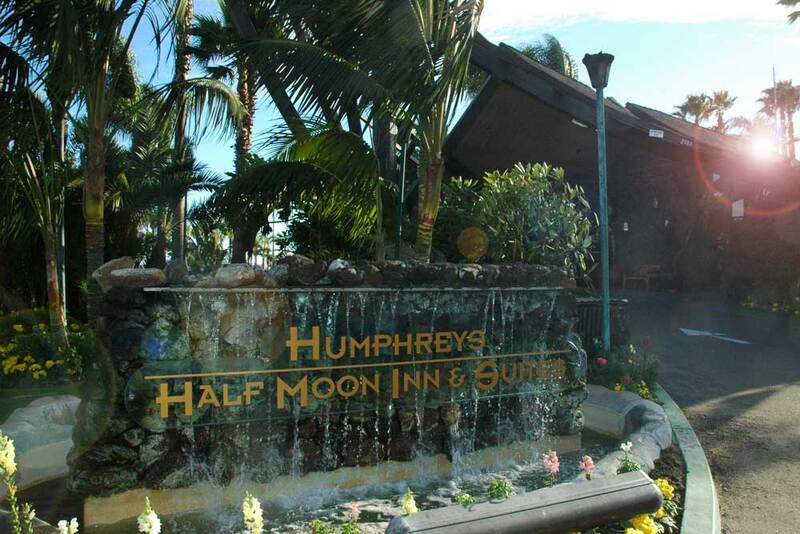 The hotel is also home to Humphrey's Concerts by the Bay, a 1,400 seat outdoor venue that quintessential San Diego. The Summer Concert series attracts big acts such as Ringo Starr or Diana Krall - check out the sailboats in the bay mooching a free concert. Though the shows are not included with your hotel rate, some rooms offer views of the stage and when the show is on the sound is everywhere. Music lovers will love this but those looking for a quiet hotel should pay attention to the concert schedule. PRO'S: Lovely tropical resort on the water for a rate that's typically less than you would expect. CON'S: Getting in and out on a concert night is a pain. WALLY SAYS: Looking for a reasonably priced tropical resort? This is it! You promised the family a tropical vacation but lately your wallet's looking thinner than Kate Moss. What's a working guy like you going to do? Book the Kona Kai Spa and Resort and you'll be on Fantasy Island faster than you can say "ze plane, ze plane!" 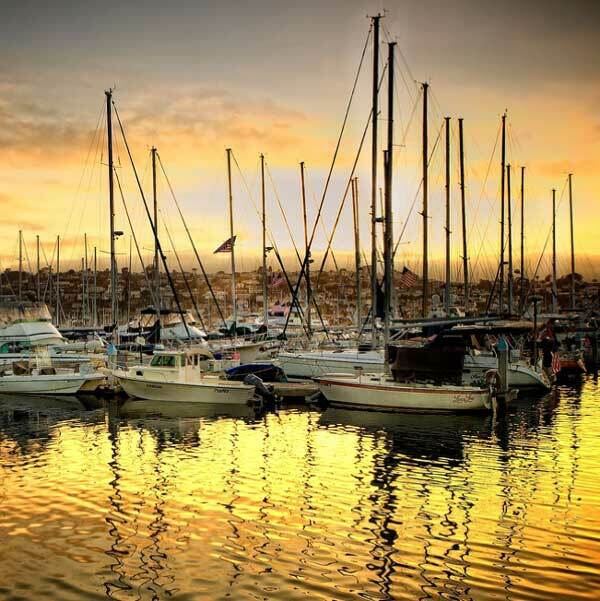 Located at the tip of Shelter Island with views of Point Loma and the ocean on one side and the private beach and marina on the other, Kona Kai's setting doesn't get much better. Add to that a recent major refurbishing and the Kona Kai is better than ever, one of the top picks for a tropical vacation on a reasonable budget. The rooms are nice and fresh and done up with an upscale California theme. There's a new modern Tiki Bar, a great new restaurant, and a freshened up pool, all surrounded by tropical landscaping. One look and you realize this isn't a Kenny Rogers facelift, this is a major remodel that brings the resort up to the level of its location. As if this wasn't enough, the Kona Kai has live music in the bar, bonfires on the beach (with fixin's to make s'mores), free beach gear, bike rentals, and many more extras that make the resort a true destination and part of your entire vacation experience. PRO'S: Just refurshished and looking good! CON'S: The exterior of the buildings still show their age a bit. WALLY SAYS: Isn't a tropical vacation what you wanted for your trip to San Diego? Talk about split personalities. 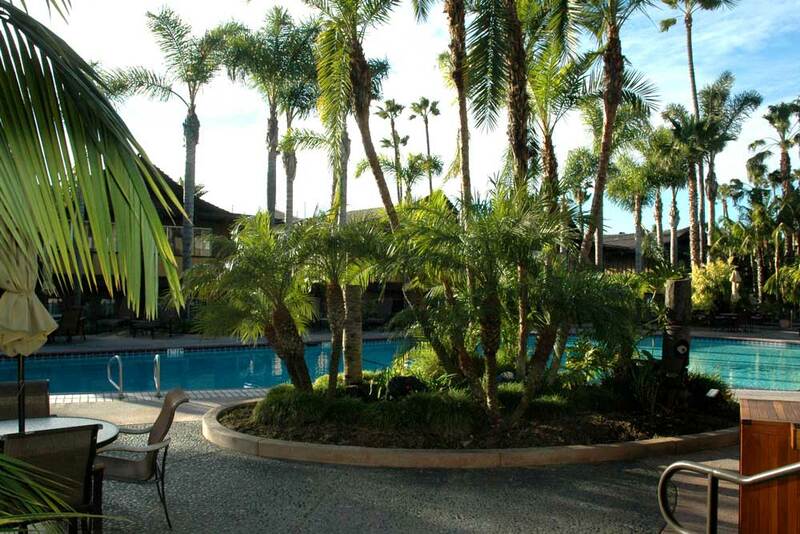 The Best Western Island Palms is half Hawaiian resort, half Mediterranean contemporary. 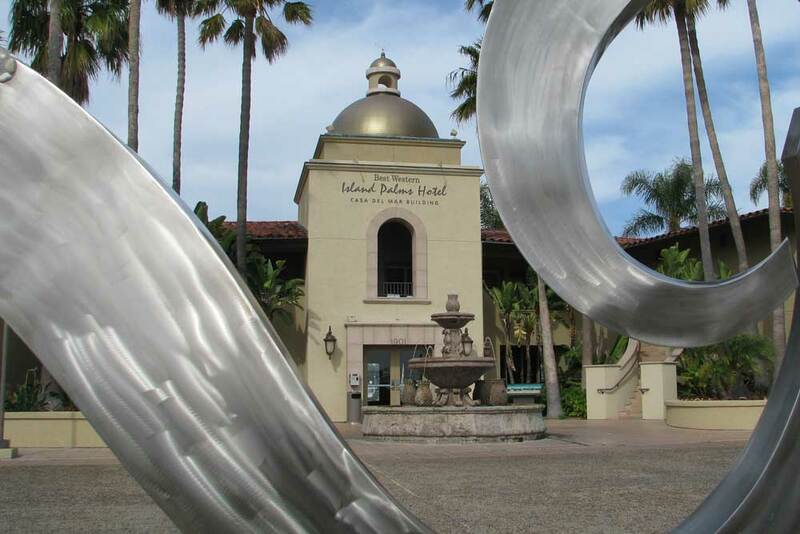 And while the Best Western chain usually isn't associated with nice resorts, the Island Palms can hold its own with some of the better family style hotels in San Diego. It's a great location, a great property, and a terrific value. Plenty of room choices, from basic standards to two bedroom villas with kitchens. Because the hotel was built at different times with different themes you'll find some inconsistencies in room amenities. Some have views, some have microwaves, some have sofabeds, some have balconies, it's all a bit confusing so be selective when checking in to make sure your room has everything you want. The Best Western Plus Island Palms is in a great location but remember, it's still a Best Western. If you're looking for a full featured resort with cocktail waitresses at the pool and ultra luxurious rooms, this isn't it. But for a reasonably price hotel in a standout location, this Best Western doesn't disappoint. PRO'S: Views of the marina, walk across the street for a sandy beach on the bay. CON'S: Lots of kids in the pool during the summer is great if you have kids, not so much if not. WALLY SAYS: Great family vacation spot. Free parking across the street. You can't get any closer to the airport than the Sheraton San Diego Hotel and Marina. Seriously, you can almost walk there. But don't think this is some lousy airport dump - the Sheraton San Diego is actually a pretty nice place with gorgeous views of the bay and marina. The hotel itself is fresh and updated and the rooms feature a nautical theme that's clean and fresh. The Bay Tower is older with the smaller pool but also has the larger rooms. The newer Marina Tower is where the lobby is located and has the much nicer pool, the bar and restaurant, though the rooms are much smaller. Both have stunning views of marina or bay. If you like more activity, go with the Marina Tower. If a bigger room is your choice, then stick with the Bay Tower. 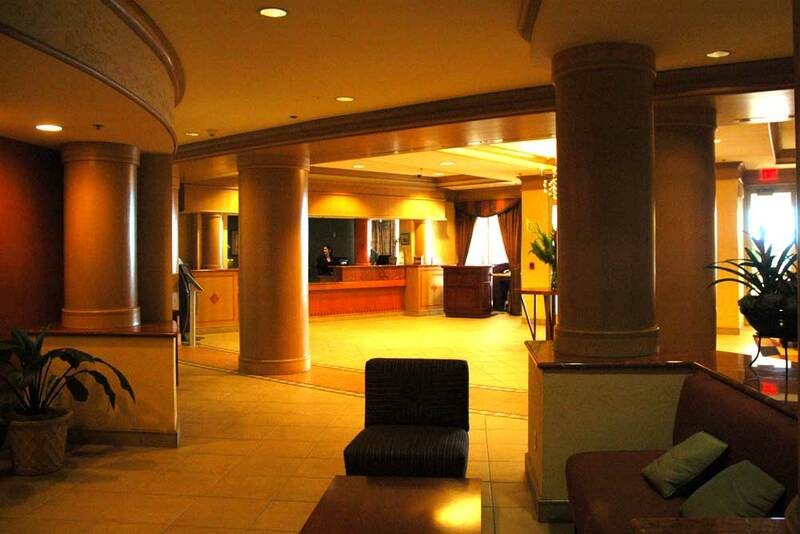 The Sheraton San Diego isn't a resort but a very nice hotel, perfect for business travel or a family vacation where the top priority is location and a nice room in a super convenient location. 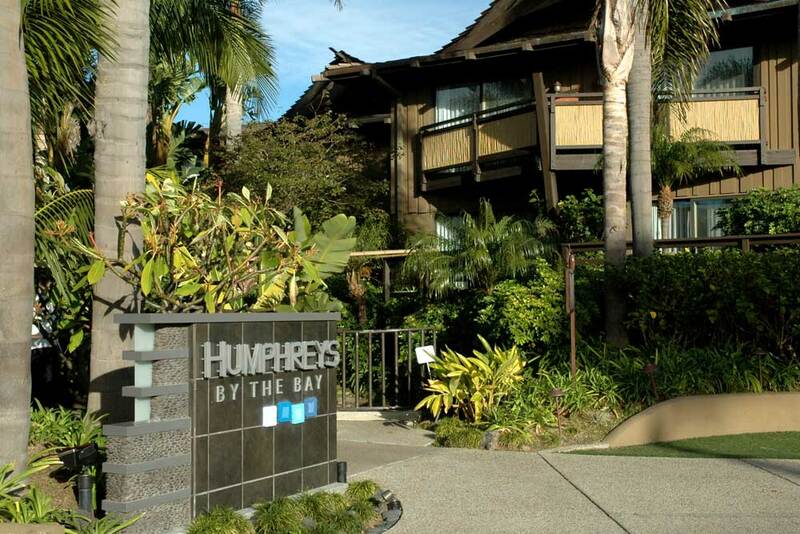 PRO'S: Excellent location next to airport with excellent views of the bay or marina. CON'S: Noise from the airport can be irritating. WALLY SAYS: Way better than you might think, a super nice hotel in a super convenient location. 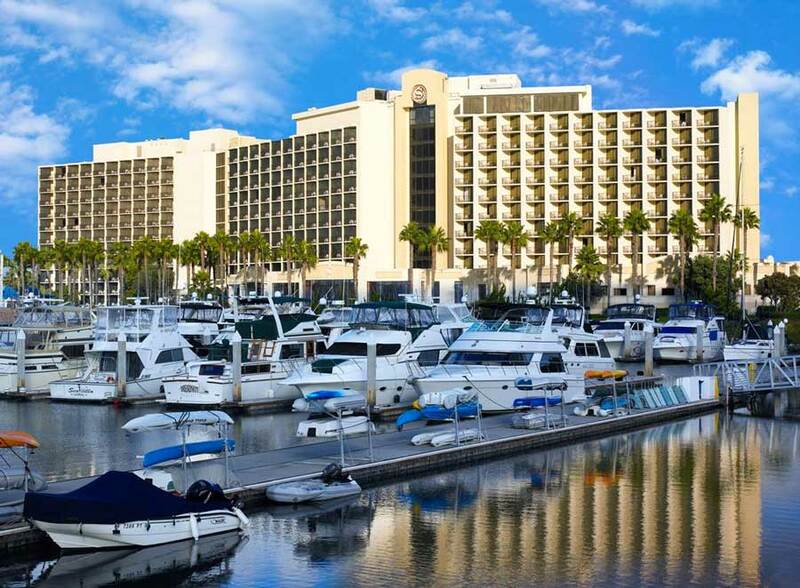 With so many Hilton hotels in San Diego it's easy to get confused, especially since the description of the Hilton Harbor Island boasts bay views with a pool overlooking the marina. But know that this Hilton, while decent, is not the Hilton you are thinking of if you're expecting big resort pools and full vacation amenities. That's because this Hilton used to be a Travelodge. That means the pool is good, but not eyedropping waterfall good, the rooms are updated and clean but without much wow factor, it's what you would expect from a good but not fancy hotel - sort of like a Travelodge. 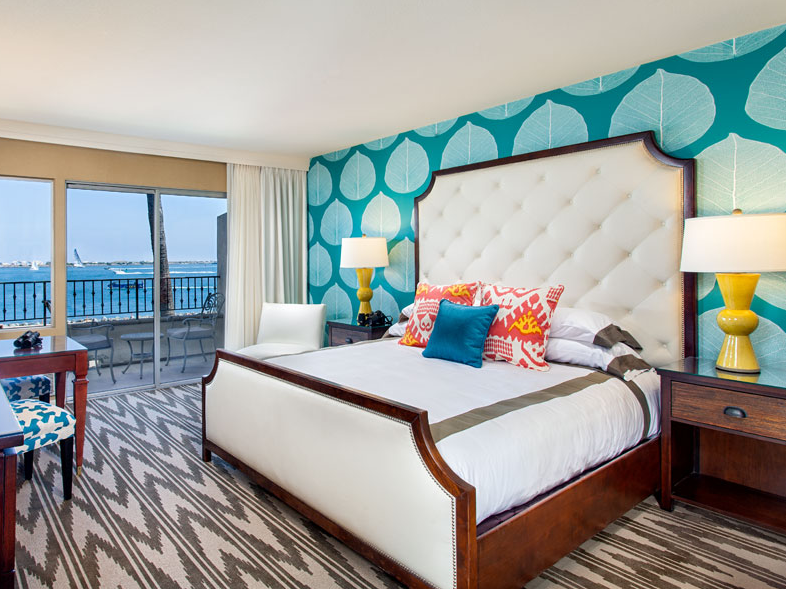 That said, the location on Harbor Island means breathtaking views of the city and it's hard to argue with its convenience, whether you're here for a convention or looking for a reasonably priced family hotel. It's better than what you might expect from a hotel that has "airport" in its name. PRO'S: Beautiful views, recently updated hotel. CON'S: Airport noise can be irritating by the pool. 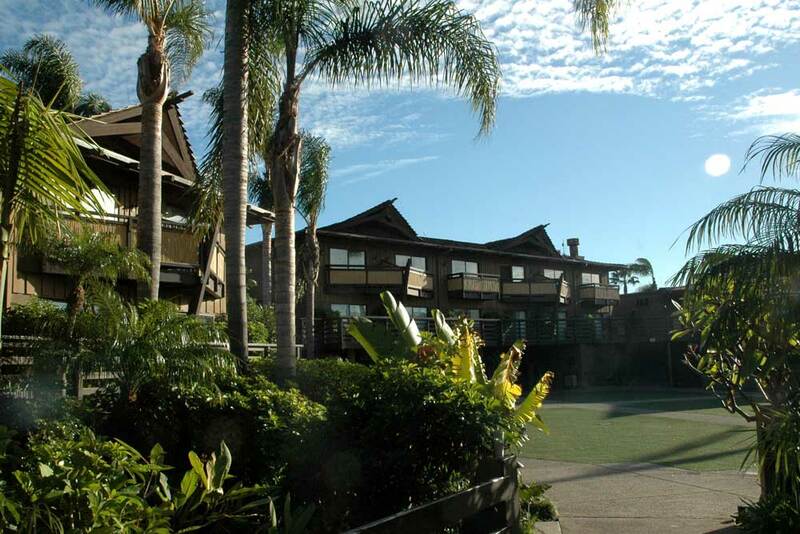 WALLY SAYS: Why stay in Mission Valley with a view of the freeway when you can stay here?